If you find it difficult to get to the gym, and standard exercise videos leave you bored, consider trying online step aerobics. Downloadable videos allow you to get instant workouts right in the comfort of your own home. Nearly every gym in the country offers some form of step aerobics. 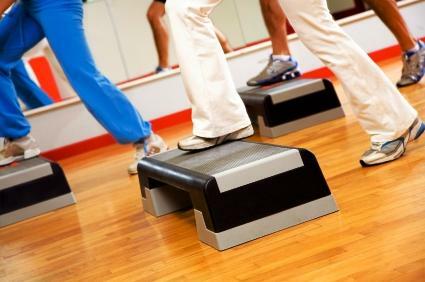 An instructor led class, step aerobics involves stepping onto platforms of adjustable height in a pattern of steps set to music. The classes can be simple or challenging, and are a great way to tone muscle and burn calories. With the advent of home workout videos, many exercise enthusiasts purchased their own platforms to try step aerobics at home. The problem with this method is boredom; after a while the same video loses its appeal. Additional videos can quickly rack up expenses, since after just a few viewings you may find yourself back in the same boat. For these reasons, online step aerobics have begun to fill this gap. Internet based step aerobics works on the same principal as an exercise video. An instructor gives you a similar workout to the one you would have received at the gym, in the comfort of your own home. You can pause the video at any time, stop and rewind to watch a sequence of steps that is beyond you, or watch the same routine again and again. Where online step aerobics differ from videos is the variety. Many internet based workout sites have a monthly subscription. You pay a low fee of usually a few dollars a month to have access to a wide range of videos. These internet based classes give you far more variety than a single DVD, while allowing you to keep trying new classes and instructors until you find a level that works well for you. New classes are frequently uploaded to the sites, meaning that you have a constant stream of new material, without having to visit a store, place an order or pay for a DVD that might not be the level you thought it would be. User reviews of each video are frequently posted online below the actual video. This allows you to gauge other's reactions before you give it a try. And if the class is too fast or too slow for you, simply call up another, switch to a different instructor or use a search option to hone in on the class that's right for you. There are a number of ways you can find step aerobics classes online. From short, free videos on YouTube, to memberships with several sites, you can sign up for the program that best fits your needs. Some will require a yearly membership, while others will allow you to subscribe by the month, with discounts given for longer time frames. Check out the following resources for step classes online. As with any step aerobics classes done at home, you will need to purchase the equipment necessary. Since the workout is not done in a class setting, you can take the breaks you need, fast-forward or rewind until you get the workout you desire. Give internet based step aerobics classes a try; they are available at any time from any internet connection, allowing you to work out on the go. If the gym schedule doesn't match yours and videos are just gathering dust on your shelf, an online step class may be the answer for you.